In 1690, William Penn chose what is now Middletown as the site of a settlement on the banks of the Susquehanna River, which runs into the Bay of Chesapeake. There were a number of Native American settlements in what is now Middletown and the immediate vicinity. In 1736 the first state road was completed running from Lancaster via Pine Ford and crossing the Swatara Creek at Middletown, to Shippensburg. Middletown was founded in 1755 by George Fisher due to it being situated halfway between Lancaster and Carlisle. George Fisher, was the great grandson of John Fisher, Merchant, who came to Philadelphia with William Penn on the first voyage of the ship “Welcome”. George came from a strict Quaker family and chafed under the strict rules of the Quakers. His father decided to send him to a tract of land in the wilds beyond Lancaster. George accepted the situation and in 1752, with a train of three Conestoga Wagons, each loaded with provisions, set out on his journey. It took him five days to reach what is now Middletown. He forded the creek in an area he called Pine Ford and camped on the south side of King’s Highway. Here he built his home which stood for one hundred and six years. 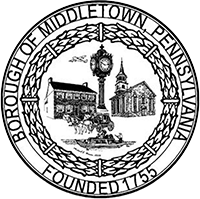 In 1755, on land deeded to him by his parents, he laid out the town and named it Middletown, because it was midway between Lancaster and Carlisle. It is the oldest community in Dauphin County. At the time of his settlement, this area was part of Lancaster County. In 1875, when Dauphin County was formed, the area became part of this new county. The original settlement consisted of three streets running east and west – Main Street, with High and Water on either side and five streets running north and south – Spring, Main (cross street, later Union), Pine, Duck (later Spruce) and Race. In 1809, George Fisher, son of the founder of Middletown, laid out an area at the junction of the Swatara Creek and Susquehanna River and called it Harborton. Sometime between 1809 and 1814, the name was changed to Portsmouth and was known as such until March, 9 1857, when the area was consolidated with Middletown and the name Portsmouth was abandoned. In the Revolutionary War, one of the first companies raised in the colonies was a group of volunteers from the Middletown – Paxton area reaching Boston in 1775. President George Washington stopped in Middletown in October 1774, and was entertained at the tavern on West Main Street with the town in 1779 being noted in Colonial records as being a supply depot for the Army during the American Revolution.